It's interesting that Midori's true power isn't to destroy but rather to repair. Does this mean that the red bugs are broken or malfunctioning machines? Let's leave an episode marker for whoever is first. I think it's helpful for those following along without running aground on spoilers. Bakaneer can't be everywhere apparently. We got a fair bit of characterization this time like lots of time with Ritsu and Midori. She's a sweet one, and seems to be coming down with Wakabitis too. This episode seemed to really push it in our face how single minded the androids(leafdroids?) seem to be - from Ritsu's love for Midori to not even a "how 'bout that" for that pole replacing itself. That pole wasn't going to find us water after all. Apparently, it wasn't very appetizing either. I wonder if the new person will be their old leader. That would really serve to shake up the group dynamic. Nice. That does strike me as a possibility. There seems to be some kind of other specialties though remembering episode 1. Rin blasts Wakaba and everything behind him is gone and he's healed. Perhaps a higher energy release or some interaction with... leaflings cause it to eliminate inorganic matter. Or perhaps it's his more organic nature that mends metal. So the Midoris heal which sort of suggests a zombies getting damaged by healing potions effect on the Mushis. I agree with MeltingSky's conclusion that it is likely to do with them being malformed in some way or twisted *somehow*. I'm interested in the answers this show gives me. I appreciate that every time we learn something, more questions spring out of the answer, it all feels very natural. Love the dynamic between Rina-tachi and Wakaba, how they treat him as some sort of curious pet. I re-watched the pre-show 90 seconds episodes: The beginning and episode 0.5 to 0.9. There are some information about the story, probably more can be dug up. The six sisters head out to find water source like the group did with Wakaba. However, three of them and one Rina died on the way. 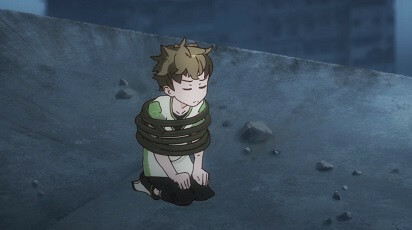 While they made it to the Island Six, found Midori, but they couldn't go any further, so they head back to Island One. And this is where the TV series starts. There is the First One (Saisho no Hito), nothing much is known about her other than she came before the sisters. Then we have the sisters, they are all specialized in one of the senses, while very weak in the others. Ritsu - specializes in hearing. Something happened to her during the first trip which make her weak. Rin - specializes in sight and physical ability. Rina-tachi - specializes in taste. The original used momo-chan to split into 6 Rina-tachi because sisters died and she wants to help out. I put spoiler tag for the three fallen sisters just in case someone haven't watch this episode yet. Ryoku - The only person in the story other than Wakaba who can read. She specializes in sight, even though she wears glasses. 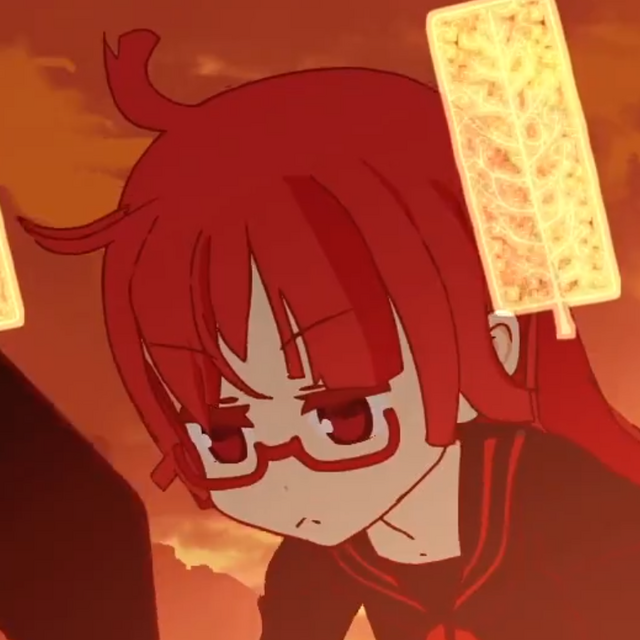 She is probably studying the mystery of the world as the yellow kemurikusa shows the sentence "About the mechanism of this world" when Wakaba waved it. Ryo - Was the strongest among the sisters, she can defeat big red bug without the help of Midori's kemurikusa. She specializes in smell. Riku - The sister we saw in episode 5. She specializes in touch and can locate water source based on humidity. 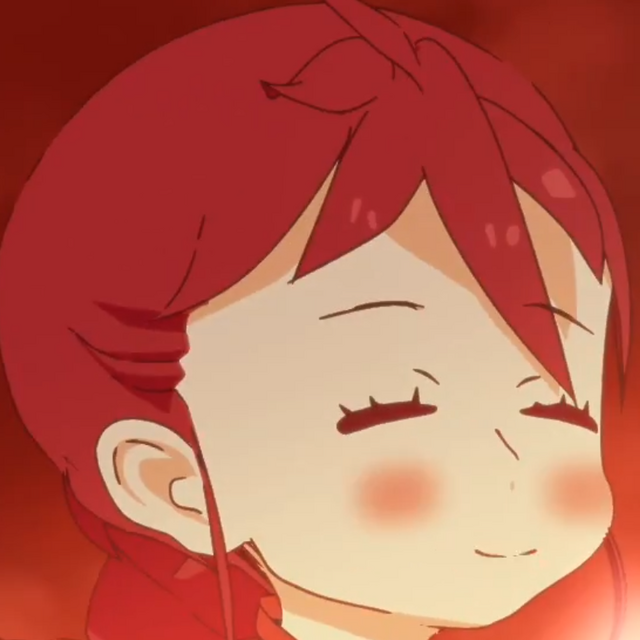 She is the only one that can lit up kemurikusa like Wakaba. 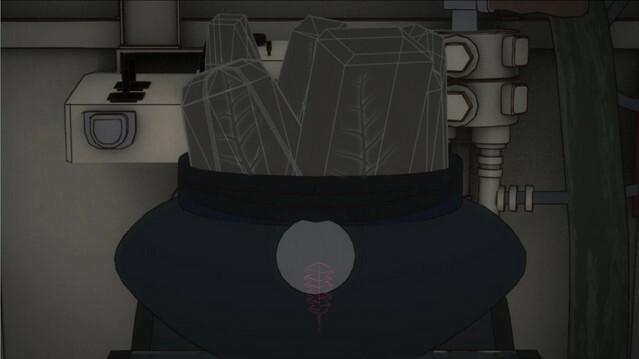 The crystal shape things in the hat Wakaba saved in episode 3 should be the Kemurikusas of the fallen sisters and two Rinas. 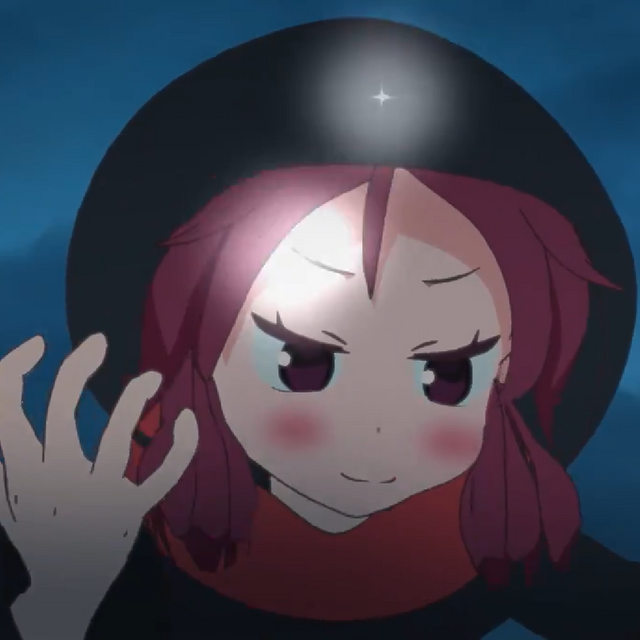 But you can also see that there is a Kemurikusa lit up in the hat right before the ending sequence. So not only Riku, Ryoku and Ryo are also resurrected (probably the two Rina-tachi too), but they decided not to get in touch with Ritsu's group. Wakaba finally learns how to use Kemurikusa with the help of Riku. Riku's reaction after knowing Wakaba has the sense of touch is kinna cute. Wakaba feels more natural compare to the previous too, and it is funny to see how bad he is in hiding secrets. 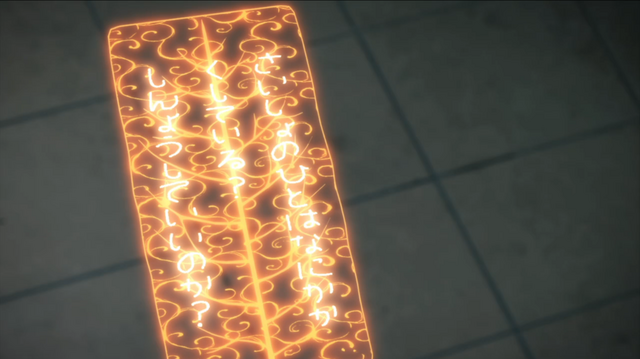 I wonder why Riku and the others don't want to meet their sister, probably have to do with the scratched out part of the memo. and the First Person uses Kanji as well. 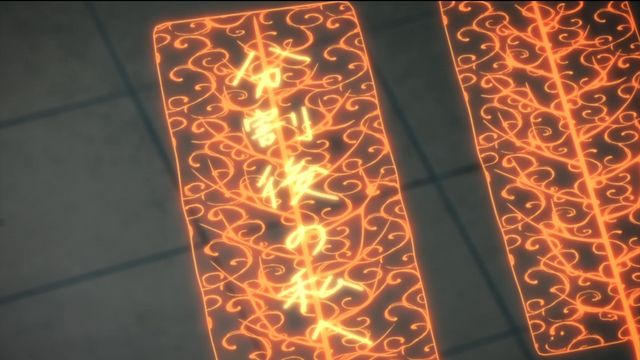 Ryoku probably didn't know how to read and write Kanji when she wrote in the Kemurikusa. Seems like First Person split into the sisters, and each one has one of the First Person's senses. This was an interesting episode. The real question is how is it the other sisters have apparently returned from the grave and have done so without their surviving sister's knowledge. Even more strangely, they don't wish for them to find out about it. Also thank the anime Gods for Wakaba's voice actor reigning it in a bit. I can't help but think Wakaba must be starving to death. Especially since he overexerts. This show is really good at atmosphere: wondrous things feel wondrous, quirky things like Riku are genuinely quirky, and reading that leaf-iPad felt ominous. That's a good point. The surreal atmosphere and lack of day and night really makes it difficult to judge how much time has passed, but I'm guessing it's been at least 24 hours at this point since they have all laid down to sleep once since first finding Wakaba. If my memory isn't failing me we have seen Wakaba drink and eat once during that time period which is a bit unusual if he is a regular modern day human. It's certainly not impossible for somebody to get by on so little, but if this continues for days on end it does raise questions about Wakaba's true nature. It's also plausible that Wakaba has both eaten and drank off screen at some point although, given the importance of water rationing, him drinking often would likely become a topic of concern and debate for the sisters which we haven't seen so far. And just the way the show has focused on the girls' need for water and supplies has made it strange that they aren't worrying about Wakaba too. It's something that feels like it should come up. But wait: did he eat some kemurikusa at some point? I feel like he did. Yes, he did eat white kemurikusa. Rina-tachi want to try it too, but they were stopped by Rin, saying it could be bad for them to eat any kemurikusa other than Midori's. I do think they did consume food and drink off screen as they keep bringing up how much water is left but we hardly see them drink any water. That's a good point. The water level has gone down noticeably. My memory is like swiss cheese but I know we have seen them divy out water at least once. The girls drink a ton but then can go ten days without another drink. I think we have seen them water Midori more than once but I could be wrong there. Also Wakabe has been watering the white kemurikusa as well. You are right, and probably most of the water was spent on Midori as Ritsu feels bad about her wishes to keep Midori in the episode 5. I've been watching this! I've noticed that Anime artists tend to lean to getting into the middle of a story and letting the audience try and figure out the plot more and more. This a quirky Anime and the CGI makes the anime figures a little stiff, but still doable. Each episode comes on on Wednesdays ad is in its sixth episode as of right now Playing on Netflix. Actually, if you are watching it on Netflix you can add the subtitles yourself but opening the Que for subtitles within Netflix. Subtitles can easily be added within the Netflix system. Kemurikusa is on Neflix and you can add custom subtitle to it? Anyway, the ones that I said have no subtitles are six 90 seconds episodes posted by Tatsuki (the director) on his personal twitter before the series on air in Japan.